Narrated Mahmud bin Labid : Allah`s Messenger said: The most dreadful thing which I fear about you is minor polytheism. The companions asked: What is the minor polytheism? He said: It is hypocrisy; and he added that on the Day of Judgement, when rewarding people for their deeds, Allah Subuhanahu wa ta`ala will say to the hypocrites: Go to those for the sake of whom you used to preform good deeds; and see whether you can get any reward from them. 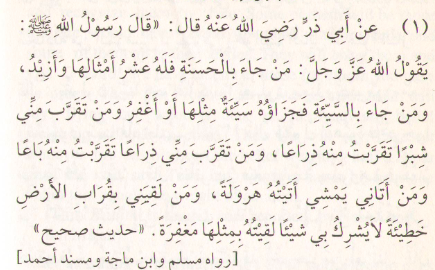 6) Narrated Abu Huraira : Allah`s Messenger said: Among all partners, I am the most dispensable with association. 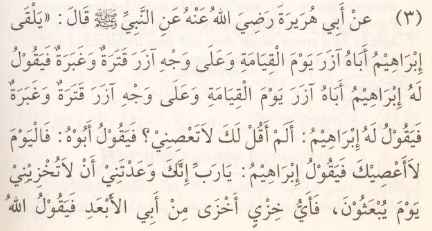 So anyone who performs a deed in which he ascribes to Me others; I will abandon him and his act of polytheism. 7) Narrated Abu Huraira : I heard Allah`s Messenger saying: The first of the people whose case will be decided on the Day of Judgment will be a man who died as a martyr. He will be brought forth. Allah will make him know about His blessings (which He had bestowed on him in the world). The man will acknowledge them. Then Allah will ask him: What did you do with them? He will say: I fought in Your way until I died as a martyr. Allah will remark: You are lying. You fought so that you may be called a brave warrior. Then orders will be passed against him. So he will be dragged along on his face and cast into Hell. 8) Narrated Abu Musa : Allah`s Messenger said: On the Day of Resurrection, my Ummah (nation) will be gathered into three groups. one sort will enter Paradise without rendering an account(of their deeds). Another sort will be reckoned an easy account and admitted into Paradise. Yet another sort will come bearing on their backs heaps of sins like great mountains. Allah will ask the angels though He knows best about them: Who are these people? They will reply: They are humble slaves of yours. He will say: Unload the sins from them and put the same over the Jews and Christians; then let the humble slaves get into Paradise by virtue of My Mercy. 9) Narrated Ibn Masud that Prophet Muhammad said: On the Day of Resurrection nations will be brought. When I see my nation (Ummah) I will be amazed at their multitudes and (distinguished) form. They will have filled up the plain lands as well as the mountains. Allah will ask me: Are you satisfied?